Florida is filled with beautiful native flowers, shrubs, trees, and vines, of all shapes, colors, and sizes. Through the years I have found that using native plants can really save on landscaping maintenance and the pocket book. I’m not a native plant elitist, by any means, and have plenty of non-native plants in my yard. However, I am a lazy gardener and have found that using native plants as often as possible makes my life easier, not to mention the entertainment value of the wildlife that it attracts. If you’re interested in Florida’s plants and animals then you may find something useful within my site. Butterfly gardening in central Florida can be as easy as learning to identify the plants used by our butterfly species for food, shelter, courtship and egg-laying. Many plants, that most people consider weeds, are important butterfly plants and are totally free for you to use to create your own butterfly garden. Read my article Butterfly Gardening in Central Florida to find out more. Attracting birds to your garden follows the same principles. Many plants that people have falsely labeled as weeds, or trash plants, provide the necessary food and shelter for Florida’s birds. You don’t need to spend a fortune on landscaping to attract birds. I bet you already have many native plants in your yard that the birds would love if you allowed them to grow to their potential instead of mowing them off. Look through my article on Native Plants for the Birds and see if you recognize any of them in your yard. 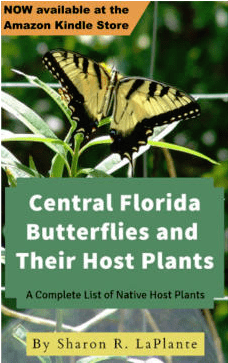 To begin your quest for a diverse and healthy butterfly garden, my book, Central Florida Butterflies and Their Host Plants: A Complete List of Native Host Plants, is now available in both ebook format and paperback from Amazon.com. I was born, and raised, in Tampa, Florida and am proud of my native Florida roots. I have studied, gardened, landscaped, and enjoyed our plant and animal ecosystems for over 40 years. I noticed a long time ago that the Florida normally depicted in movies and magazines is not my Florida, but rather a glitzy, often gaudy, cosmopolitan Miami-kind of Florida, which is quite different from most of the rest of our Sunshine State. The Florida I know and love is a delightfully diverse collection of local plant and animal habitats from our hardwood hammocks, with their several hundred year old oaks, to our saw grass marshes and inland waterways with their manatees and otters. Once you move inland from our coastal beaches, you soon discover a world of surprising diversity and beauty. A place where the fox or the bobcat is as likely to appear as is the palm tree in the tourism poster you have likely seen before. 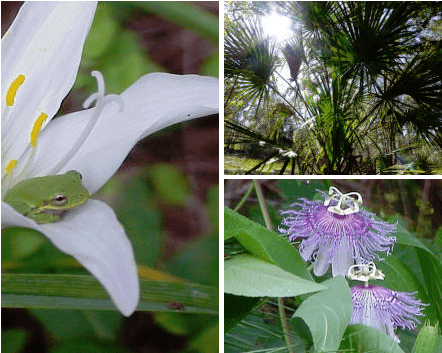 Several years ago I founded the Hernando Chapter of the Florida Native Plant Society in a grass-roots effort to bring together people with an interest in natural Florida and their fellow students from academia, forestry and wildlife habitat management. I found it uncommonly rewarding to serve others who share a common interest in our endemic plants and animals, and the plant society was the perfect outlet for my enthusiasm. During this time I was also a Master Gardener with the Hernando County Extension Office, and would later be offered a position by Hernando County to run their just-created, ‘Florida Yards & Neighborhoods’ program. Unfortunately, persistent illness prevented me from accepting this position, and I was eventually forced to drop out of both the Native Plant and Master Gardener groups. I have been fortunate enough to see several of my articles published in Eco-Florida magazine and many of my photographs in Gil Nelson’s book, Florida’s Best Native Landscape Plants, and the Florida Association of Florida Native Plant Nurseries Guide. 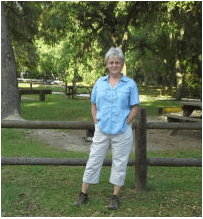 SharonsFlorida.com is an extension of my life as a naturalist. Here you will find articles I’ve written over the years, some originally for the plant society’s newsletter, as well as my recent publications. Visit Sharon’s Florida eBay Store to purchase seeds and other garden related items.Please take a look around and learn something about central Florida today. Thank you for stopping by and have a great garden! Check out my new book at Amazon.com - ebook and now paperback!